On board the ships of CroisiEurope you will be introduced to the most beautiful rivers in Europe where art, culture and culture all embrace each other passionately. The cabins aboard the Beethoven are all cosy outside featuring warm colours that provide a pleasant atmosphere. 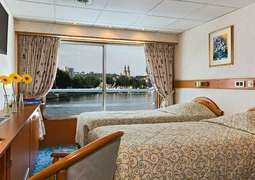 All cabins have two beds which can either be merged or kept secret, and some even contain an additional third folding bed. For lone travelers there are also single cabins available. All cabins come with a shower and toilet, towels, telephone, TV, safe, hairdryer and adjustable climate control. You can look forward to delicious International cuisine aboard this ship in surroundings which allow one to feel as if they are living the French lifestyle. The incredible fare on offer during your stay is part of the reason that the company has been so successful across Europe. Aboard this ship you will experience the most beautiful landscapes along the rivers and get to know the many cultures found on the banks of said rivers during the onshore excursions. There are a number of different activities available to you as part of the entertainment programs offered by the crew as well as the chance to simply relax with a good book from the library or listening to music in the lounge bar. During the day time it is recommended that you wear more comfortable, casual attire and more formal wear during the evenings.